D’Amato and colleagues discuss the idea that thunderstorms in pollen season can induce severe asthma attacks in susceptible pollinosis patients. A key message for susceptible patients is increasing awareness of being outdoors during a thunderstorm in the pollen season could trigger an asthma attack. Davies et al in the BMJ (2018) also discuss the phenomenon of epidemic thunderstorm asthma. They suggest proactive measures to identify and pre-emptively protect susceptible people are critical to mitigating the effects of thunderstorm asthma. Whilst known previous asthma seems to be an inadequate predictor of risk, seasonal allergic rhinitis (hay fever) from grass pollen allergy, and degree of sensitisation, appears to be a universal risk factor among affected patients. Author(s) Davies, J.M., Thien, F. and Hew, M., 2018. Chang, Y.S., 2018. Non-pharmacologic Therapies for Severe Asthma. In Severe Asthma (pp. 123-129). Springer, Singapore. Larsson, K., Ställberg, B., Lisspers, K., Telg, G., Johansson, G., Thuresson, M. and Janson, C., 2018. Prevalence and management of severe asthma in primary care: an observational cohort study in Sweden (PACEHR). Respiratory research, 19(1), p.12. Licari, A., Castagnoli, R., Brambilla, I., Marseglia, A., Tosca, M.A., Marseglia, G.L. and Ciprandi, G., 2018. New approaches for identifying and testing potential new anti-asthma agents. Expert opinion on drug discovery, 13(1), pp.51-63. Sobieraj, D.M., Weeda, E.R., Nguyen, E., Coleman, C.I., White, C.M., Lazarus, S.C., Blake, K.V., Lang, J.E. and Baker, W.L., 2018. Association of Inhaled Corticosteroids and Long-Acting β-Agonists as Controller and Quick Relief Therapy With Exacerbations and Symptom Control in Persistent Asthma: A Systematic Review and Meta-analysis. JAMA, 319(14), pp.1485-1496. Chang (2018) identifies inhaler technique and adherence as the the key factors of successful management in severe asthma. He discusses factors to aid self-management such as patient education to maintain regular medications; a written action plan and awareness of environmental triggers such as inhalant allergens, smoking, air pollution, respiratory infections, and obesity. Licari et al (2018) in their review provide a comprehensive and updated overview of the currently available, new and developing approaches for identifying and testing potential treatment options for asthma management. They discuss future therapeutic strategies for asthma needing the identification of reliable biomarkers that can help with diagnosis and endotyping, in order to determine the most effective drug for the right patient phenotype. Furthermore they conclude that a better understanding of the mechanisms of airway remodeling will likely optimize asthma targeted treatment. Pike et al (2018) in their Cochrane systematic review found that seasonal omalizumab treatment from four to six weeks before school return may reduce autumn asthma exacerbations. Negative associations included injection site pain and treatment costs. Sobierj and colleagues (2018) in a systematic review and meta-analysis discuss combined use of inhaled corticosteroids and long-acting beta-agonists (LABAs) as the controller and the quick relief therapy termed single maintenance and reliever therapy (SMART) which could be a potential therapeutic regimen for the management of persistent asthma. A Swedish study by Larsson found that patients with severe asthma had few regular contacts with both primary and specialist care, and more than half of them experienced poor asthma control. Please contact Hearing Library staff if you have any trouble accessing or finding these articles (or others!). World Hearing Day is held on 3 March each year in order to raise awareness and understanding of deafness and hearing loss, and to promote ear health and the care provided by audiologists across the world. This year’s theme is “Hear the future”, and World Hearing Day 2018 hopes to draw attention to the anticipated rise in people with hearing loss around the world in the coming decades. The WHO’s figures estimate 466 million people worldwide live with disabling hearing loss. Unless action is taken, by 2030 the number will rise to nearly 630 million. Key initiatives for #WorldHearingDay2018 include preventative strategies to stem the rise in hearing loss and steps to ensure access to the necessary rehabilitation services; communication tools and products for people with hearing loss. All of these are important areas of research for Action on Hearing Loss, the UCL Ear Institute, the Royal National Throat, Nose and Ear Hospital, and many other colleagues and organisations in the UK and further afield. Throughout the week we will be writing blogs highlighting evidence and information in support of “Hear the future”, and World Hearing Day. References: World Health Organization. (2018). 3 March 2018: World Hearing Day. [online] Available at: http://www.who.int/deafness/world-hearing-day/whd-2018/en/ [Accessed 23 Feb. 2018]. Tinnitus frequently appears in newspapers and online news sources. Because anyone who suffers from a chronic condition can get frustrated, despressed and angry at the inabilty of medical science to cure the condition, that makes people ready to grasp at anything that could give them hope, offering to alleviate or cure the condition. Tinnitus is no exception, and below are a few recent stories that cover it, all in this case from the Daily Mail, though other papers and websites could equally have been included. who produced the study or studies behind the story? are they reputable researchers, or are they selling something? has the article given the original source where the study is published? is the newspaper story written by someone who knows what they are writing about, or is it a staff writer who is regurgitating a press release which has a positive spin? If the study is based on a group of patients, was it a small number or a large number? I am not saying these stories are invalid, but the headlines are never written by the author, and they often disguise the facts. People come away remembering the headlines, not the complete story. Read these stories, but with caution. Tinnitus is an active area for research, because it bothers so many people. Even if you do not have it, there is a good chance you know someone who has it in some form, ranging from a minor irritation to a serious frustration. People are looking for cures, but management of the condition seems the most realistic solution for most people. Here are a few suggested books that might help those who have tinnitus. Living with tinnitus and hyperacusis, by Laurence Mckenna, David Baguley and Don McFerran, 2010. This book has 4 or 5 stars in 75% of the Amazon.co.uk public reviews. Tinnitus Week is an international event raising global awareness of this condition taking place from 5-11 February 2018. The aim of the week is to raise awareness of the condition. This blog post gives a quick overview of some patient information sources, all of which meet NHS England’s patient information standard. The website also has a case study of living with tinnitus which is now on BBC news. ENT UK, a professional membership body that represents Ear, Nose and Throat and its related specialities also has patient information on tinnitus that can be downloaded from: https://www.entuk.org/sites/default/files/files/ENT/About%20Tinnitus%206pp%20DL%20%2809028%29_7_16.pdf. 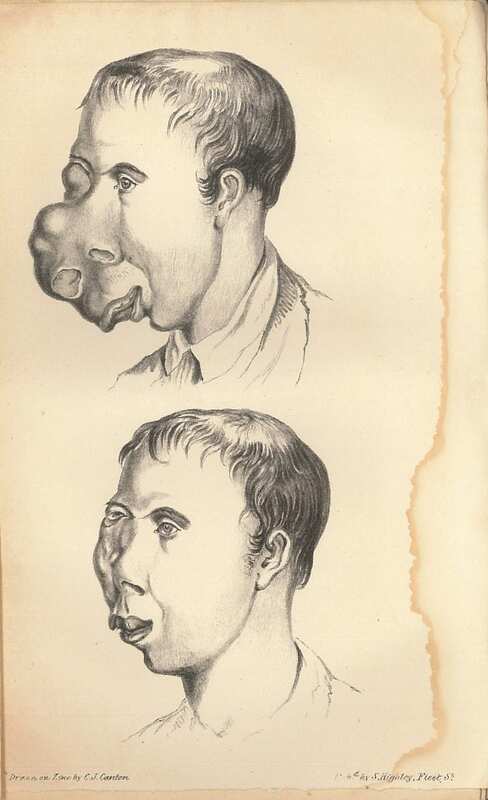 In Guy’s Hospital Reports for September 1836, there is an article, “Cases of exostosis of the bones of the face, disease of the cranium, and fractures of the frontal and parietal bones requiring operation, by Mr. Morgan.” Mr. John Morgan was a pupil of Sir Astley Cooper. Plarr’s lives of the Fellows, tells us that Morgan “showed an intense interest in natural history, and began to stuff birds and small animals almost as soon as he could use a knife and his fingers.” We also discover there, that he dissected an elephant named ‘Chum,’ took an awful lot of snuff, and was one of the founders of the Zoological Gardens in Regent’s Park, now London Zoo. His brother-in-law William Gosse who was a surgeon and was related to Philip Henry Gosse, emigrated to Australia. the right nostril being enormously expanded and closed by the enlargement of the tumor, which, from its size, completely concealed the eye on that side, and extended downwards into the mouth, being there connected with the palatine and alveolar processes of the right superior maxillary bone; projecting also forwards, so as to press the lip beyond the teeth, to the extent of two inches. The bones apparently implicated in the disease were the ossa nasi, superior maxillary bone, vomer, and the inferior turbinated and malar bones. The poor fellow, when admitted, complained of no pain; and I could not find that his sufferings had given him much inconvenience, during the whole of his disease.The general health appeared good; but he was greatly emaciated, more, I believe, from want of proper food, than from the constitutional effects of his disorder. 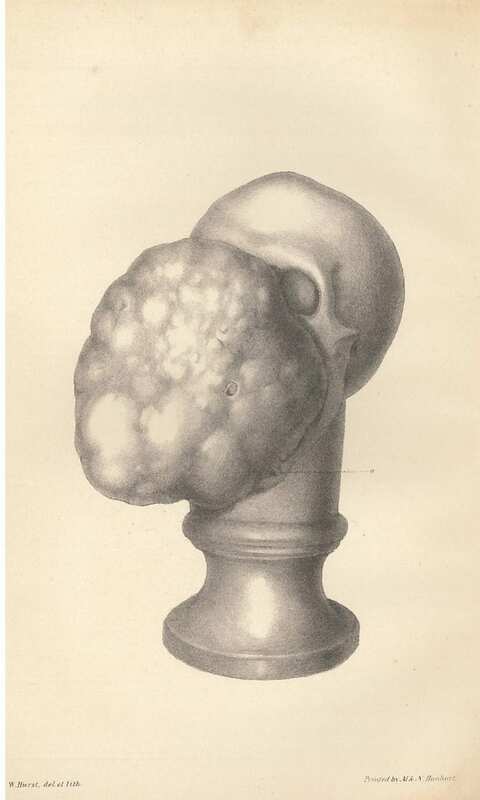 Deciding that the tumor was common exostosis, an opinion in which Morgan was supported by Sir Astley Cooper and Dr. Hodgkin, he “removed the morbid excrescence” on the 6th of November. He first made an incision over the right nostril, to ascertain that it was indeed exostosis. A semilunar incision was then made, extending over the nostril, from the internal angle of the right eye to the centre of the the upper lip. A similar incision was made on the outer side, commencing at the angle of the eye, and joining with the other, at the lip. The integuments were then dissected from around the tumor, , and a metacarpal saw was used for its removal; and as it was of a spongy texture, it offered little resistance to the instrument. No great quantity of blood was lost during the operation , the exostosis not being very vascular; and it was only found necessary to secure one vessel, a superficial branch of the transverse facial. all further disposition to haemorrhage was easily restrained by pressure. After the tumor had been thus removed, the integuments were brought together by an uninterrupted suture; a dossil of lint was placed over the wound, and confined by adhesive plaster; and over all, a light bread-and-water poultice was applied. The patient bore the operation with great fortitude; and said afterwards, that he suffered but little pain, excepting when the first incision was made. Unfortunately I cannot locate any record of Lochland Shiel on family history records or census returns, though a Locklin Sheels married a Margaret Boyle in Newcastle-under-Lyme on the 22nd of December, 1834. That might be him. It could be that he was missed, it could be he spent time in Ireland, or it could be that his name has been wrongly transcribed. If you have any ideas about where in Ireland he was from, or any family, do contribute in the comments. In the spring of 1842 Shiel died in Birmingham. I have been unable to find a death record for anyone of his name. Someone must have dissected his remains to make a cast of the tumor – and presumably, his skull. Below is the cast that shows the tumor. As you can see, it had grown enormously in the following years. The dotted line points to the tiny space through which Shiel ingested food. After tweeting a recent article on wind turbine noise and sleep (the third below) I thought it might be timely to look at some recent articles in Medline. Some of these are freely available – follow the links to PubMed to see the abstracts or the articles where available. It will not have escaped some of you that wind turbines can also affect wildlife. There is one particular article just out that surveys the literature with regard the cetaceans, freely available, Consolidating the State of Knowledge: A Synoptical Review of Wind Energy’s Wildlife Effects. As ever, when you consider how valuable an article it is, examine it critically, for example sample size, whether it is original research or a review article, and so on. This wiki page may help if you are new to this. Jalali L, Nezhad-Ahmadi MR, Gohari M, Bigelow P, McColl S. The impact of psychological factors on self-reported sleep disturbance among people living in the vicinity of wind turbines. Environ Res. 2016 Jul;148:401-10. doi: 10.1016/j.envres.2016.04.020. Epub 2016 Apr 29. Michaud DS, Feder K, Keith SE, Voicescu SA, Marro L, Than J, Guay M, Denning A, McGuire D, Bower T, Lavigne E, Murray BJ, Weiss SK, van den Berg F. Exposure to wind turbine noise: Perceptual responses and reported health effects. J Acoust Soc Am. 2016 Mar;139(3):1443-54. doi: 10.1121/1.4942391. Kageyama T, Yano T, Kuwano S, Sueoka S, Tachibana H. Exposure-response relationship of wind turbine noise with self-reported symptoms of sleep and health problems: A nationwide socioacoustic survey in Japan.Noise Health. 2016 Mar-Apr;18(81):53-61. doi: 10.4103/1463-1741.178478. Michaud DS, Feder K, Keith SE, Voicescu SA, Marro L, Than J, Guay M, Denning A, Murray BJ, Weiss SK, Villeneuve PJ, van den Berg F, Bower T. Effects of Wind Turbine Noise on Self-Reported and Objective Measures of Sleep.Sleep. 2016 Jan 1;39(1):97-109. doi: 10.5665/sleep.5326. Abbasi M, Monazzam MR, Akbarzadeh A, Zakerian SA, Ebrahimi MH. Impact of wind turbine sound on general health, sleep disturbance and annoyance of workers: a pilot- study in Manjil wind farm, Iran. J Environ Health Sci Eng. 2015 Oct 12;13:71. doi: 10.1186/s40201-015-0225-8. eCollection 2015. Feder K, Michaud DS, Keith SE, Voicescu SA, Marro L, Than J, Guay M, Denning A, Bower TJ, Lavigne E, Whelan C, van den Berg F. An assessment of quality of life using the WHOQOL-BREF among participants living in the vicinity of wind turbines.Environ Res. 2015 Oct;142:227-38. doi: 10.1016/j.envres.2015.06.043. Epub 2015 Jul 11. Onakpoya IJ, O’Sullivan J, Thompson MJ, Heneghan CJ. The effect of wind turbine noise on sleep and quality of life: A systematic review and meta-analysis of observational studies.Environ Int. 2015 Sep;82:1-9. doi: 10.1016/j.envint.2015.04.014. Epub 2015 May 16. Review. Schmidt JH, Klokker M. Health effects related to wind turbine noise exposure: a systematic review.PLoS One. 2014 Dec 4;9(12):e114183. doi: 10.1371/journal.pone.0114183. eCollection 2014. Review. Magari SR, Smith CE, Schiff M, Rohr AC. Evaluation of community response to wind turbine-related noise in western New York state.Noise Health. 2014 Jul-Aug;16(71):228-39. doi: 10.4103/1463-1741.137060. Knopper LD, Ollson CA, McCallum LC, Whitfield Aslund ML, Berger RG, Souweine K, McDaniel M. Wind turbines and human health.Front Public Health. 2014 Jun 19;2:63. doi: 10.3389/fpubh.2014.00063. eCollection 2014. Review. Pawlaczyk-Łuszczyńska M, Dudarewicz A, Zaborowski K, Zamojska-Daniszewska M, Waszkowska M. Evaluation of annoyance from the wind turbine noise: a pilot study. Int J Occup Med Environ Health. 2014 Jun;27(3):364-88. doi: 10.2478/s13382-014-0252-1. Epub 2014 May 13. Rubin GJ, Burns M, Wessely S. Possible psychological mechanisms for “wind turbine syndrome”. On the windmills of your mind.Noise Health. 2014 Mar-Apr;16(69):116-22. doi: 10.4103/1463-1741.132099. Roberts JD, Roberts MA. Wind turbines: is there a human health risk? J Environ Health. 2013 Apr;75(8):8-13, 16-7. Hume KI, Brink M, Basner M. Effects of environmental noise on sleep. Noise Health. 2012 Nov-Dec;14(61):297-302. doi: 10.4103/1463-1741.104897. Review. Nissenbaum MA, Aramini JJ, Hanning CD. Effects of industrial wind turbine noise on sleep and health. Noise Health. 2012 Sep-Oct;14(60):237-43. doi: 10.4103/1463-1741.102961. Chapman S. Editorial ignored 17 reviews on wind turbines and health. BMJ. 2012 May 15;344:e3366; author reply e3367. doi: 10.1136/bmj.e3366. No abstract available. Bakker RH, Pedersen E, van den Berg GP, Stewart RE, Lok W, Bouma J. Impact of wind turbine sound on annoyance, self-reported sleep disturbance and psychological distress. Sci Total Environ. 2012 May 15;425:42-51. doi: 10.1016/j.scitotenv.2012.03.005. Epub 2012 Apr 3. Shepherd D, McBride D, Welch D, Dirks KN, Hill EM. Evaluating the impact of wind turbine noise on health-related quality of life.Noise Health. 2011 Sep-Oct;13(54):333-9. doi: 10.4103/1463-1741.85502. Knopper LD, Ollson CA. Health effects and wind turbines: a review of the literature. Environ Health. 2011 Sep 14;10:78. doi: 10.1186/1476-069X-10-78. Review. Pedersen E, Persson Waye K. Wind turbine noise, annoyance and self-reported health and well-being in different living environments. Occup Environ Med. 2007 Jul;64(7):480-6. Epub 2007 Mar 1.